This is a delightful finishing hole. 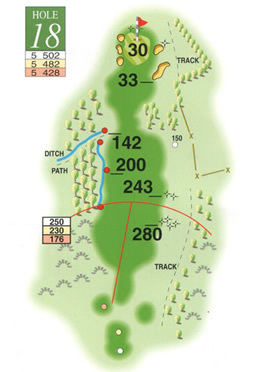 A par 5 which downwind offers an excellent chance of birdie. The tee shot is downhill with no immediate hazards coming into play and a well-placed drive can leave a long second shot into the green, but there are five protecting greenside bunkers that can dash birdie hopes into par or bogey. The green has a leading upward slope so if the pin is further to the back and the slope is overcome, a relatively straight putt is on offer.